The median personal income was $13,624 while the mean was $18,362 in the CNMI at the time of the survey. Persons with less than $10,000 was 18.2% of all persons that reported personal income in 2016; persons with $10,000 to $19,999 was 56.0%; those with $20,000 to $29,999 was 13.1%; those with $30,000 to $49,000 was 9.1%; while those with $50,000 or more was 3.6%. The median personal income was practically the same in all three islands: $14,000 in Tinian, $13,600 in Saipan, and $13,662 in Rota. The mean personal income was slightly higher in Saipan ($18,744) than in Rota ($17,722) and in Tinian ($16,964). The percentage of persons with personal income of less than $10,000 was higher in Rota (27.0%) than in Tinian (23.5%) and in Saipan (17.5%). The percentage with personal income of $10,000 to $19,999 was higher in Saipan (56.9%) while practically the same in Rota (47.5%) and Tinian (47.2%). The percentage with personal income of $20,000 to $29,999 was practically the same in Saipan (15.2%) and in Tinian (15.1%) and lower in Rota (13.2%). The percentage of those with $30,000 to $49,999 was higher in Tinian (12.7%) while the same in Saipan and in Rota (both 8.9%). The percentage of those with personal income of $50,000 or more was practically the same in Saipan (3.7%) and in Rota (3.4%) and lower in Tinian (1.4%). The median personal income was highest in District 5 ($14,580) and lowest in District 2 ($12,000), while the mean personal income was highest in District 4 ($20,272) and was lowest in District 2 ($13,505). The percentage of persons with personal income of less than $10,000 was highest in 2 (18.9%) and was lowest in District 4 (12.5%). The percentage of persons with personal income of $10,000 to $19,999 was highest in District 2 (67.7%) and was lowest in Districts 3 and 5 (both 53.6%). The percentage of persons with personal income of $20,000 to $29,999 was highest in District 4 (15.4%) and was lowest in District 2 (9.3%). The percentage of persons with personal income of $30,000 to $49,999 was highest in District 5 (11.0%) and was lowest in District 2 (3.4%). The percentage of persons with personal income of $50,000 or more was highest in District 5 (6.4%) and was lowest in District 2 (0.7%). The median wage and salary income was $13,920 while the mean was $18,310 in the CNMI at the time of the survey. Persons with wage and salary of less than $10,000 was 14.5% of all persons that reported wage and salary income in 2016; the percentage of persons with wage and salary of $10,000 to $19,999 was 60.2.0%; those with $20,000 to $29,999 was 12.7%; those with $30,000 to $49,000 was 9.2%; while those with $50,000 or more was 3.3%. 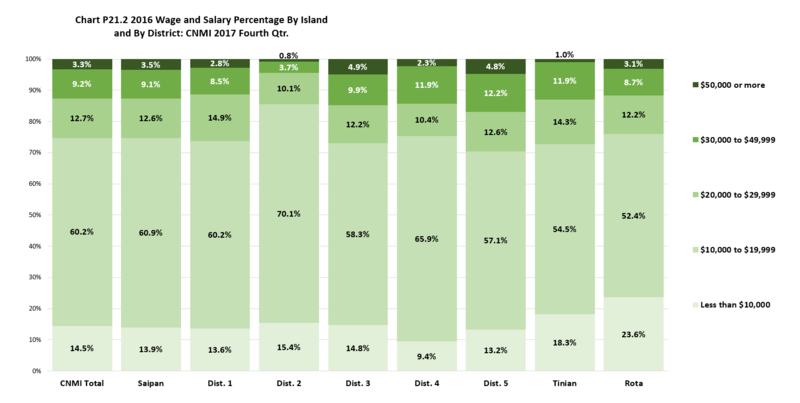 The median wage and salary income was practically the same in all three islands: $14,000 in Tinian, $13,800 in Saipan, and $13,624 in Rota. 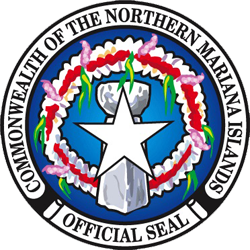 The mean wage and salary income was slightly higher in Saipan ($18,621) than in Tinian ($17,478) and in Rota ($17,322). The percentage of persons with wage and salary income of less than $10,000 was higher in Rota (23.6%) than in Tinian (18.3%) and in Saipan (13.9%). The percentage with wage and salary income of $10,000 to $19,999 was higher in Saipan (60.9%) than in Tinian (54.5%) and in Rota (52.4%). The percentage of those with $20,000 to $29,999 was higher in Tinian (14.3%) while practically the same in Saipan (12.6%) and in Rota (12.2%). The percentage of those with $30,000 to $49,999 was higher in Tinian (11.9%) than in Saipan (9.1%) and in Rota (8.7%). The percentage of those with wage and salary income of $50,000 or more was higher in Saipan (3.5%) than in Rota (3.1%) and was lower in Tinian (1.0%). The median wage and salary income was highest in District 5 ($15,000) and lowest in District 2 ($12,576), while the mean was highest in District 5 ($20,684) and was lowest in District 2 ($14,433). The percentage of persons with wage and salary income of less than $10,000 was highest in District 2 (15.4%) and was lowest in District 4 (9.4%). The percentage of persons with wage and salary income of $10,000 to $19,999 was highest in District 2 (70.1%) and was lowest in District 5 (57.1%). The percentage of persons with personal income of $20,000 to $29,999 was highest in District 1 (14.9%) and was lowest in District 2 (10.1%). The percentage of persons with wage and salary income of $30,000 to $49,999 was highest in District 5 (12.2%) and was lowest in District 2 (3.7%). The percentage of persons with personal income of $50,000 or more was highest in District 3 (4.9%) and was lowest in District 2 (0.8%). The median household income was $21,600 while the mean was $31,603 in the CNMI at the time of the survey. Households with income of less than $10,000 was 11.1% of all households that reported income in 2016; the percentage of households with income of $10,000 to $19,999 was 34.7%; those with $20,000 to $29,999 was 18.2%; those with $30,000 to $39,999 was 12.4%; those with $40,000 to $59,999 was 11.9%; those with $60,000 to $99,999 was 7.3%; while those with $100,000 or more was 4.4%. The median household income was higher in Saipan ($22,920) than in Tinian ($20,000) and in Rota ($17,739), while the mean was higher in Saipan ($33,058) than in Rota ($28,627)) and in Tinian ($27,298). The percentage of households with income of less than $10,000 was higher in Rota (22.6%) than in Tinian (21.2%) and Saipan (11.1%). The percentage of household with income of $10,000 to $19,999 was higher in Saipan (35.3%) than in Rota (30.6%) and Tinian (28.8%). The percentage of households with income of $20,000 to $29,999 was higher in Saipan (18.5%) than in Tinian (17.0%) and in Rota (13.8%). The percentage of households with income of $30,000 to $39,999 was higher in Saipan (12.9%) than in Rota (8.6%) and in Tinian (8.2%). The percentage of households with income of $40,000 to $59,999 was higher in Rota (16.7%) and in Tinian (16.3%) and was lower in Saipan (11.4%). The percentage of households with income of $60,000 to $99,999 was higher in Saipan (7.4%) than in Tinian (7.2%) and lower in Rota (3.5%). The percentage of households with income of $100,000 or more was higher in Saipan (4.7%) than in Rota (2.4%) and Tinian (1.3%). The median household income was highest in District 5 ($33,932) and lowest in District 3 ($19,049), while the mean was highest in District 5 ($42,738) and was lowest in District 2 ($22,598). The percentage of households with income of less than $10,000 was highest in District 3 (12.4%) and was lowest in District 5 (5.4%). The percentage of households with income of $10,000 to $19,999 was highest in District 2 (42.3%) and was lowest in District 5 (24.5%). The percentage of households with income of $20,000 to $29,999 was highest in District 3 (28.5%) and was lowest in District 4 (13.4%). The percentage of households with income of $30,000 to $39,999 was highest in District 5 (20.6%) and was lowest in District 2 (7.0%). The percentage of households with income of $40,000 to $59,999 was highest in District 4 (17.5%) and was lowest in District 3 (8.0%). The percentage of households with income of $60,000 to $99,999 was highest in District 5 (10.9%) and was lowest in District 2 (3.1%). The percentage of households with income of $100,000 or more was highest in District 5 (8.8%) and was lowest in District 2. 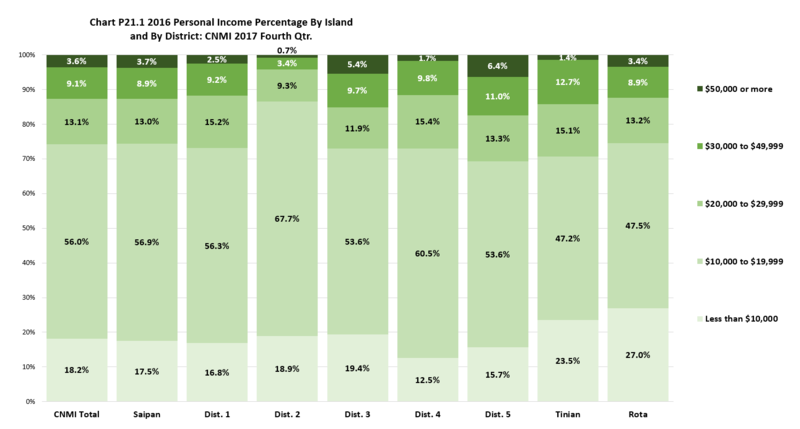 LFS 2017 Table P21.1 2016 Personal Income by Island and by District: CNMI 2017 Fourth Qtr. LFS 2017 Table P21.1 Median & Mean for 2016 Personal Income by Island and by District: CNMI 2017 Fourth Qtr. LFS 2017 Table P21.2 2016 Wage and Salary by Island and by District: CNMI 2017 Fourth Qtr. LFS 2017 Table P21.2 Median & Mean for 2016 Wage and Salary by Island and by District: CNMI 2017 Fourth Qtr. 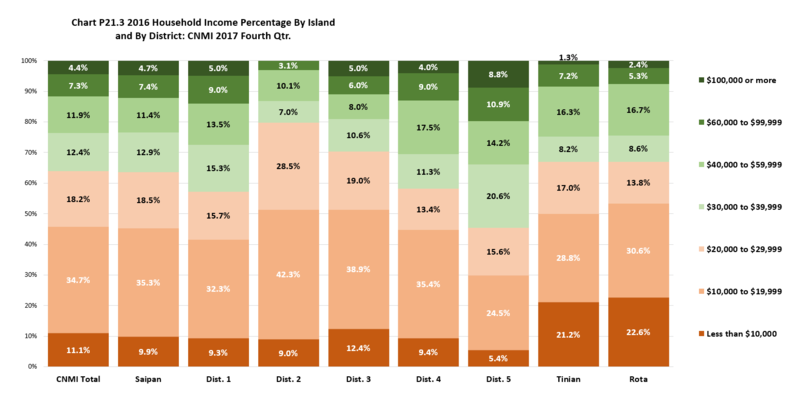 LFS 2017 Table P21.3 2016 Household Income by Island and by District: CNMI 2017 Fourth Qtr. LFS 2017 Table P21.3 Median & Mean 2016 Household Income by Island and by District: CNMI 2017 Fourth Qtr.